On Tuesday, June 5, 2012, the Amateur Astronomers Association of Princeton and the Princeton University Department of Astrophysical Sciences will host the Venus Transit Open House. This will be the last opportunity to observe a solar transit of Venus in our lifetime. Activities will begin at 4 pm in Peyton Hall, 4 Ivy Lane, Princeton. There will be presentations explaining the transit phenomenon as well as activities for children. Before the 6:04 pm start of the transit, the group will go to the University Engineering Quad parking deck to safely observe the transit through specially filtered telescopes until sunset, around 8:20 pm. Visitors will watch the conclusion of the transit in Peyton Hall via a live video feed from Hawaii, which will also be available if skies are cloudy. Admission is free and the public is welcome. Ample free parking is available across from Peyton Hall. 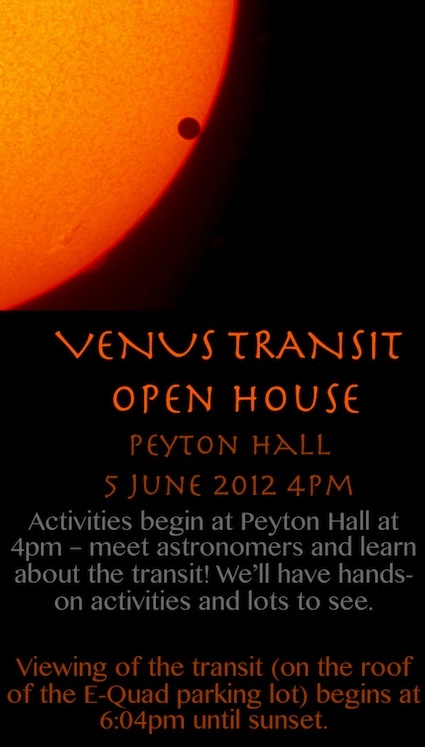 Anyone interested in attending should RSVP to info@princetonastronomy.org.